Thierry Neuville (#5 Hyundai i20 Coupe WRC) wins the Rally Italia Sardegna with an incredible 0.7sec margin over Sebastien Ogier (#1 Ford Fiesta WRC). After a three-day battle and more than 300 kilometers of special stages, Neuville defeated Ogier on the very last stage, the 6.96km long Power Stage, overturning Ogier’s advantage of 0.8 seconds to his victory. It’s Neuville’s third win of the season and his ninth WRC victory in a career. Behind the leading duo, Esapekka Lappi (#9 Toyota Yaris WRC) finished third to reach his first podium of the season and the second in a career. He was almost two minutes behind the winner and almost a minute ahead of fourth-placed Hayden Paddon (#6 Hyundai i20 Coupe WRC). Mads Ostberg and Craig Breen collected valuable points for Citroen at P5 and P6 respectively. Jari-Matti Latvala (#7 Toyota) was in a fight for a podium until the end of Saturday’s programme, when a broken alternator stopped him on road section and he had to retire. He restarted on Sunday with a 10-minute time penalty, picking up at least some points. His teammate Ott Tanak finished ninth overall, also restarting under SuperRally rules after his car was damaged in a heavy landing at Saturday’s SS9. Teemu Suninen (Ford, 10th) and Andreas Mikkelsen (Hyundai, 19th) are two more drivers who restarted after a retirement. Mikkelsen’s retirement was especially painful because he was in the lead until SS5 and had to stop on SS7 due to gearbox problems. Jan Kopecky (Škoda Motorsport) finished eighth overall and scored his third WRC-2 victory this season. He defeated teammate Ole Christian Veiby by more than three minutes. Nicolas Ciamin (Hyundai i20 R5) was third in the WRC-2 category. After seven WRC rounds in 2018, Neuville leads the championship with 149 points. Ogier follows with 122 points while Toyota’s Tanak and Lappi are third and fourth with 79 and 70 points respectively. 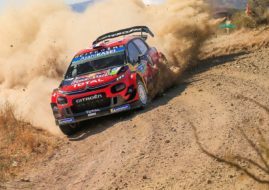 The next round of the 2018 World Rally Championship is the Rally Finland, scheduled for July 26-29.